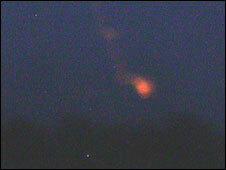 Cpl Mark Proctor told the Sun newspaper he saw 13 craft "zig-zagging" over Tern Hill barracks, near Market Drayton. Other people also reported sightings. The Ministry of Defence has confirmed it was handed a soldier's mobile phone footage from 7 June. 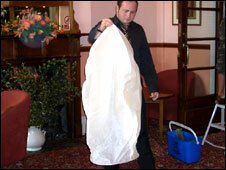 However, the Tern Hill Hall Hotel believes Chinese lanterns it released for a wedding reception are to blame. Cpl Proctor reported seeing a "fleet" of objects at about 2300 BST. "They were like rotating cubes with multiple colours," he said. But hotel manager Stuart Willett believes he holds the key to the mystery. "On the 7th of June we had a wedding where she had sky lanterns - you can light the lanterns and they float off into the air like hot air balloons," he said. He said it was the third or fourth time the hotel had used the lanterns, which he said "burn up until they disintegrate". "We've had inquiries from residents before, but it's the first time it's been classed as a UFO," he said. Mr Willet said he thought it was "highly hilarious", but added the hotel would give some advance warning before the lanterns were used again.